Signature Concrete and Coatings, Inc. Comment: over 20 years ago someone installed carpet on the outside patios. The glue is no longer sticking to the carpet BUT it is sticking to the cement. I just want the adhesive removed from the cement. I really don't want another surface or more carpet. I just need to adhesive removed from the concrete. I have about 400 sf in the back and 100 sf in the front. Comment: more than 20 years ago someone glued carpet onto the out door patios. The glue is no longer sticking to the carpet BUT it is on the concrete. I need someone to remove the adhesive from the concrete. I don't want it resurfaced or re carpeted, I just want the glue removed. I have about 400 sf on the back patio and 100 sf on the front entry (outside). Comment: I want to add a concrete slab on the side of my yard, also stucco current brick walls, add Patio awning, add new Gate, small fountain in corner. Need a written quote and simple drawing to send to the HOA for approval. Once approved by HOA we can begin work. Comment: It is the driveway for a two car garage. Thanks. Comment: I would like to get an estimate for remodeling patio door into a window. The patio door is attached to a flat roof. There's a small patio area (3ftx8ft) made of tiles, Homeowner wants the small area removed. Homeowner described area as a terrace surrounded by iron gate Needs spray roof spary foam insulation *PATIO IS 43 IN WIDE, 12 FT LONG. 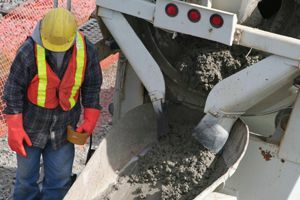 Las Vegas Concrete Contractors are rated 4.73 out of 5 based on 465 reviews of 23 pros. Not Looking for Concrete Contractors in Las Vegas, NV?